bebop spoken here: Kamasi Washington and the Next Step @ Cheltenham Jazz Festival, Big Top - May 6. 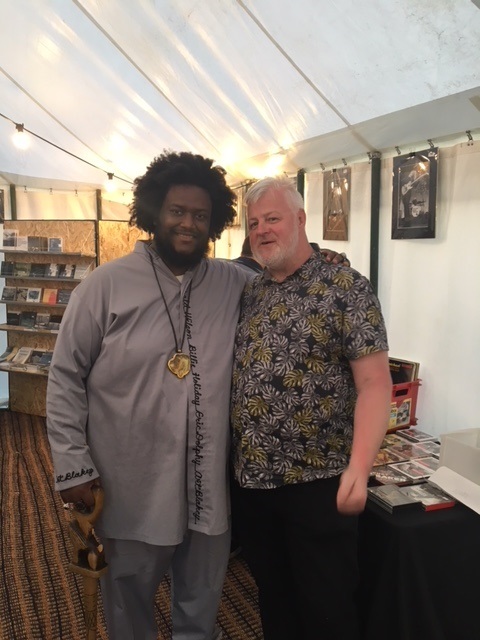 Kamasi Washington and the Next Step @ Cheltenham Jazz Festival, Big Top - May 6. Kamasi Washington (tenor), Ricky Washington (flute, soprano), Ryan Porter (trombone), Patrice Quinn (vocal), Brandon Coleman (keyboards), Miles Mosley (bass), Tony Austin, Robert Miller (drums). He was introduced as 'the biggest thing in Jazz at the moment' and I for one wouldn't disagree. Opening piece, his father switched from flute with the other horns to soloing on soprano for a frenzied free-jazz workout, gaining in intensity under keyboardist Brandon Coleman, with both drummers giving it that. Things initially cooled down for the leader's solo, and amongst the innovative nature of his music, it's easy to forget what a fine musician he is, but he gradually brought it back up with some frantic sax playing. Great to see so many cool young kids really into it amongst us old fogeys, and a couple of cuts from the forthcoming album Heaven and Earth show promise that the mammoth (and patchy) triple CD Epic, followed by an EP Harmony of Difference is not the total of what he's got to offer. Fist of Fury, named after his and my favourite Bruce Lee film, opened with lone sax before becoming - to these ears - more Spaghetti Western, with a touch of reggae, and becoming increasingly funky, led by clavinet. The vocal was more spoken word and a bit like a Bond theme tune, working the title into the lyrics. His father took a flute solo before what was clearly a much anticipated high point, especially for the young'uns; a thunderous upright bass solo from Miles Mosley, complete with bow and effects. Space Travellers Lullaby found Patrice Quinn (I'm fairly certain) singing alongside the assembled horns before solos from 'bone and piano. Next up, the concluding section of the EP Truth, featuring, he informed us, five interwoven melodies. Bass intro, keyboards, singing along with the horns, another blistering solo from the leader, more funk from clavinet, with just bass and drums and by its conclusion, everything was thrown in. The highlight of the set for me. The final piece was a vocal from Epic called Rhythmic Changes, dad back on soprano after lots of flute throughout the set, Mosley's bowed bass taking Kamasi's solo up for one last time. They didn't play an encore and I don't think anybody expected them to. It was already complete. Oh wait. It wasn't. Silly me.